Kathmandu: Hundreds of riot police used tear gas and batons as they clashed with Maoist protesters in Nepal’s capital Kathmandu during the first day of a three-day general strike, police and eyewitnesses said. The clashes ensued after protesters hurled bricks and stones at policemen who tried to clear the blocked road in Kathmandu. Police at first retaliated by pelting stones at the protesters but later started charging them with batons and fired tear gas to chase them away. At least 15 protesters were injured in the clash, an ‘AFP’ reporter at the scene said. “We used force after the protesters turned violent and began attacking police by pelting stones," police spokesman Bigyan Raj Sharma said. “We used water cannons and tear-gassed the protesters to bring the situation under control," said Sharma. “The situation remained tense throughout the day in several parts of the city." The police officer said 21 policemen were injured and one of the officers, who suffered head injuries, was in a critical condition. The protest—the biggest since the Maoists fell from power in May after eight months in office—has brought the country to a standstill. 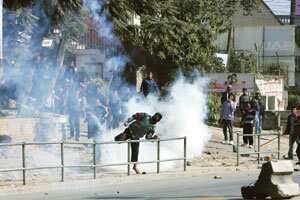 Maoist spokesman Dinanath Sharma said the group had no alternative other than to call strikes to press their demands. “All attempts to forge a consensus have so far been futile. The political parties running the government are not serious about addressing our demands," he said.